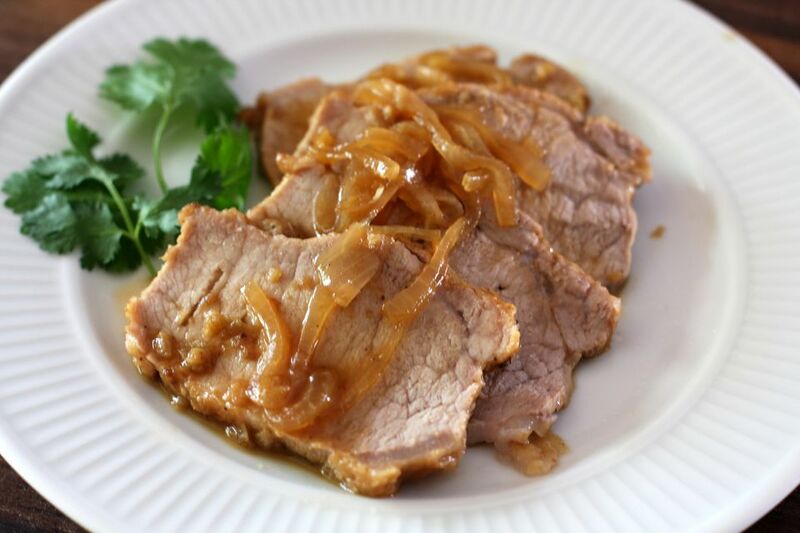 This braised orange pork loin is quick and easy to prepare on the stovetop. The orange juice and garlic give the pork amazing flavor. The pork loin is trimmed and then browned with some Cajun or Creole seasonings. Braising the pork in the tangy orange-and-garlic mixture makes it tender and delicious. Serve this easy pork dish sliced with mashed or baked potatoes or rice. Add steamed broccoli or green beans for an excellent family dinner. Remove any netting from pork and pat dry. Heat oil in a large Dutch oven or deep saute pan over medium heat. Combine the Cajun seasoning, pepper, and flour on a plate. Roll the pork loin in the flour mixture to coat all sides. When the oil is hot but not smoking, put the pork in the pan and brown on all sides. Add the onions and continue cooking for 1 minute. Reduce the heat to medium-low and add the orange juice, garlic, balsamic vinegar, and brown sugar. Cover and simmer the roast for about 1 hour, or until an instant-read thermometer inserted into the center of the roast registers at least 145 F.
Garnish slices of pork with fresh chopped cilantro, if desired. Orange Glazed Pork Chops are Lick-Your-Plate Delicious!